May 11, 2016 – The National Center for Atmospheric Research (NCAR) will be unveiling a major new exhibit about climate change. The exhibit, housed in NCAR’s landmark Mesa Lab in south Boulder, Colorado, will be free to the public. The multimedia displays at NCAR’s Mesa Lab will constitute what is believed to be the region’s largest permanent exhibit dedicated to climate change. It will highlight the workings of our climate system, how scientists study it, and the potential impacts of warming temperatures and altered precipitation patterns on society and the environment. “Our goal is to provide the public with an engaging and scientifically accurate forum to learn about climate change, which is perhaps the signature environmental challenge of our time,” said Becca Hatheway, exhibits manager at the University Corporation for Atmospheric Research, which manages NCAR. The touchscreens, audio recordings, activities, and artistically designed panels will entirely replace a more text-oriented exhibit that dated from 2003. 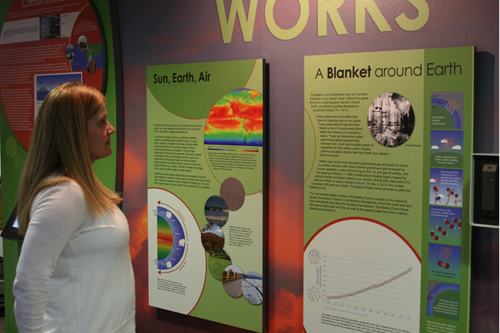 The Mesa Lab draws about 100,000 visitors a year to its exhibits on weather, the Sun, supercomputing, and other topics related to the atmospheric sciences. Although climate change can be a grim subject, the exhibit also aims to leave visitors with a sense of hope. It includes a major section that helps guide visitors through choices they can make, such as consuming less electricity or gas, which can have implications for climate change. “We don’t want visitors leaving the exhibit feeling nothing but doom and gloom,” Hatheway said. The exhibit will be divided into five sections, each designed with input from NCAR scientists. The sections provide an overview of our climate system, the influence of greenhouse gases, the techniques that scientists use to study climate, the impacts of climate change on society and ecosystems, and strategies for reducing our carbon footprint and adapting to a changing climate. One of the highlights is an interactive exhibit called “Shifting the Weather Odds.” Using balls that drop into different slots, visitors will be able to see how higher emissions of greenhouse gases will lead to extreme heat waves occurring more frequently. Another interactive exhibit, “Choose our Future,” will enable visitors to select activities such as the use of lower-carbon building materials and see how that would affect global temperatures by century’s end. In addition, the exhibit will feature a touchscreen with “Community Stories” — recordings of people across the country sharing observations about local climate change and what they’re doing about it. Visitors eventually will be able to upload their own stories. Condit Exhibits is building and installing the exhibit. NCAR Senior Scientist Jeffrey Kiehl, who provided guidance during the planning process, said the exhibit can help adults and children alike learn more about climate change. NCAR’s Mesa Lab expects to unveil the new exhibit next month.